I started building webpages at Last.fm in early 2005. In the days of the old Audioscrobbler site, from our glamorous Whitechapel headquarters, the social music revolution was starting to take shape. And I thought I was the one of the lucky few shaping it. The first time I sat next to RJ watching our real-time access logs, I didn’t recognize half the URLs scrolling past. Instead of profile pages and forum posts, it was screenfuls of recenttracks.rss and artisttags.xml requests. Huh? Since 2003, we had been operating under a pretty simple premise: Being able to get data out of Last.fm –- whether one person’s recently played tracks or community-driven artist and tag info — was as important as being able to put it in. Five years on, traffic from the incredible wealth of mashups, widgets, and services that leverage Last.fm data matches traffic to our website itself. These applications — contributed by fans, companies, and partners around the world — have literally built the social music revolution. I can take my music profile wherever I go on the net; I can sort my friends by musical compatibility; I can explore interactive graphs and stats; I can scrobble tracks from platforms and devices whose names I can’t even pronounce. This is just a small piece of our much larger goal for 2008, which will include a re-launch of our developer site, along with new and improved APIs for some of our most important functionality. 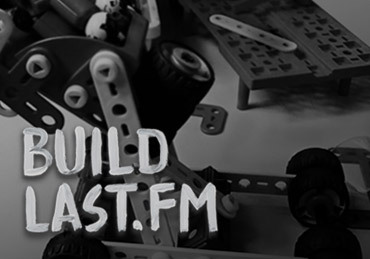 Have you built something too? We’ve already added some popular apps to the gallery, but if you can’t find your creation, please tell us all about it. cool, I am going to submit my new ruby library soon. should help integrating last.fm support to rails applications. Pretty cool. I can’t wait for the ‘re-launch of the developer site, along with new and improved APIs for some of our most important functionality.’ — YES. Hopefully something along the lines of the Flickr API or anything which is better than the feeds / plain text data at the moment. “build.last.fm” redirects me to the dashboard site. Yep, this happens if your language isn’t English. We’re working on a fix to this. I submitted my crappy little PHP experiment (more meant as a learning tool for myself than anything) but I don’t really expect to see it put on the gallery. Wow, suppose the stats group is going to feel a little unneccessary now ! very well designed and useful page, I wonder if you are going to add a permanent link to it in the official page , maybe in www.last.fm/widgets ? Is there going to be full album playback at any time in the future????????????????? Yup — we hope to improve the categories and requirements stuff soon, plus add the ability to add / edit / rate items. ^^^ False alarm. Damn Greasemonkey. Sorry Matt. man, with this PLUS the ball pit, I would practically kill to work with you guys now. I would be a perfect customer service rep, too, except I live in Iowa (USA) and not London. I LOVED London when I was there, too. (And yes, I was mostly in East London—Leyton, specifically. loved it.) I am quite serious and quite sad. Mourning my loss! maybe a way to see the last added tools would be handy. something to work with yahoo pipes easier, such as those rss feeds, would be really great, although I’m a noob at pipes. I most eagerly await the new API’s. It would be nice to see some of the various info bits available through the API (listeners, plays, etc.) instead of being forced to resort to scraping. One more thing (that might already been there!?). When you propose an app, it would be nice to be notified by email if it was put on the page or rejected. I’ve posted an app on Saturday, see that it was reached once from ‘otrs.last.fm/otrs/…’ on Sunday, but have got no clue if it’s in the queue for treatment or if it has been rejected. Thanks anyway, much appreciated service! this page didn’t have a sign in place, so i wasn’t able to sign in so you might not know who i am, but i just want to say, that last.fm is the greatest idea in the world! thanks! And that’s the thing, I use Last.fm to discover music and like-minded people. I’m rarely interested in actually listening to music on Last.fm (though I do that occasionally). I’m more interested in what the music that I’ve already listened to says about me: what I may like, who I may like, what discussions I could be having, etc., etc. Sometimes Last.fm has the visualization that I want, other times someone else does. Even something as simple as a recently played badge does this. Since everything I put in I can get back out, Last.fm is my first stop for looking for music information, similar artists, people, etc. The result is more page views for you and more click-throughs to purchase music. Keep the focus on social: social is everyone and everything. last.fm data feeds are one of the coolest features of the site, I am glad that new and improved features will be available in the future. One feed I am really hoping for is for global top tracks and global top artists so I can add them to my last.fm node script for mediamonkey. Awwh men! No I really want to come up with sum’thing really cool based on those webservices… I love it. Nice of you to stick it to the idiots at Apple by posting MobileScrobbler on the front page of build.last.fm. It’s worth noting that a similar app could not be made using Apple’s official SDK, as their terms require that all apps be self-contained, and that you can’t run background processes. As a venue operator, I need an API to add/edit events for single venues, multiple venues per-artist and festivals. I’m looking at re-enabling our webservices to push the gig information to last.fm and other event lists like upcoming.org. Hey Sam, you will see a big web services drive from us in the coming months. This will include the ability to submit different types of content to Last.fm. That particular API hasn’t been discussed yet as there are moderation issues around event creation, but I will keep it in mind. I had last.fm open automatically for months before I realised how much my wife and kids listen to their stuff on itunes and hence how incompatible I am now with my mates (thanks to Sting, Blink 182 and Junior Senior). I have now set Last to open when i want but how do i rid myself of the naff stuff that I wasn’t listening to? I’m not sure if this is the correct place to report a problem but the pages are broken in IE7, the description and link are missing. BTW I see that you added option to add comments , nice! Hey there – how can I incorporate my JamsBio into Last? How does one add events onto this site? Can we? I love MobileScrobbler so much.